Despite the gearbox concerns, the 10 Series tractors were still a great success and part of that success was also due to the fact that each particular model could be bought in a variety of different specification options. On the previous 600 Series tractors the Q cab was supplemented by a low-profile option built by Lambourn but with the Series 10 tractors there were now three cab options. Top of the three was of course the bubble Q cab, next came two cabs designed and built for Ford by Sekura. The AP was a rather square and boxy looking cab that was made for general purpose work, AP actually standing for All Purpose. This was a considerably cheaper option than the deluxe Q cab and was often chosen by stock farmers and the like. 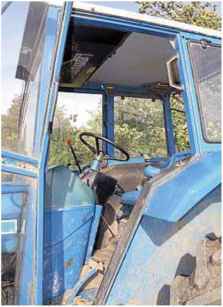 The cheapest option was the Sekura-built LP cab, or Low Profile cab, which was designed specifically for livestock farmers in mind who had to work their tractors within low buildings. 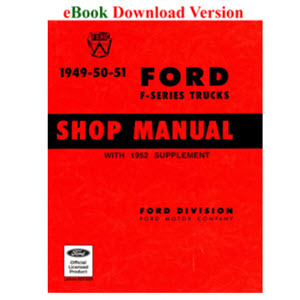 This wide choice added considerably to the versatility of the Ford tractor range of the early 1980s. Although the smaller 2610 and 3610 three-cylinder models were still offered, most farmers preferred to go for the bigger four-cylinder tractors or the 4610. However, the 2610 and 3610 carved quite a niche for themselves as highway and industrial tractors and were often the preferred choice of councils for grass cutting and other amenity work. The 4610 was still a lively performer and was the biggest of the three-cylinder models. Like the other smaller models, the 4610 did tend to look a bit top heavy when fitted with the large Q cab which was quite tall and looked even taller on these small machines. 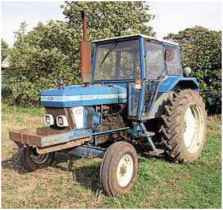 Next up was the 72hp 5610 which was the smallest four-cylinder tractor and one that was often specified with the AP or LP cab option rather than the Q cab. Two-wheel drive versions of the Ford 7710 were still popular with many farmers who did not want the expense of four-wheel drive. This example still works in Suffolk. The 10 Series looked different to their predecessors, with redesigned bonnets that included a llftable front nose cone to gain access to the air cleaner. The low-profile LP cab was built for Ford by Sekura. Roadless who took the Ford tractor skid unit and fitted either large equal size-driven wheels or smaller front wheels that were also powered. The 10 Series saw a large part of the market now gobbled up by Ford itself, at least in the smaller size front wheel sector, as Ford never tried to make equal size wheel four-wheel drive machines. 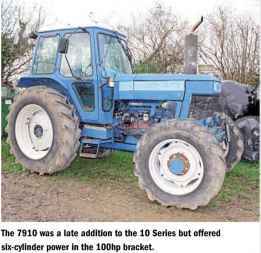 The 7610 was a formidable tractor with a turbocharged four-cylinder engine producing 103hp and was the biggest in the range that could be specified with the AP cab alternative. The 6710 and 7710 replaced the 6700 and 7700 respectively. These tractors kept the high build of their forebears, including the floor-mounted gear levers which made these machines an even more popular choice with those farmers wishing to keep with the Ford brand but avoid the Rubik's Cube gearbox. The 6710 was somewhat underpowered for its rather large size but the 98hp 7710 was a superbly well-balanced tractor and the addition of factory-fitted four-wheel drive only helped to make a good tractor even better. 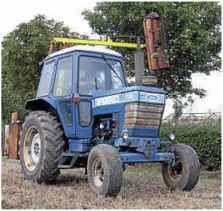 The company were so pleased with the performance of the Ford 7710 that it was then chosen to take part in a ploughing marathon complete with Ransomes ploughs mounted on both the front and the rear!